Now available in a travel friendly packaging! Great for testing too! This cream is one of Mizon's best-selling products showcasing snail filtrate in Korea's skin innovation. It is formulated with 92%!! Snail Filtrate and several other anti-aging ingredients that deeply nourishes skin for a healthier, smoother and brighter appearance. This All in One Snail Repair Cream is your skin's choice for hydration, to improve appearance of fine lines and wrikles, and to treat acne scars and hyperpigmentation. Because of its gel-like consistency, this cream applies and absorbs easily without slimey or sticky after-feeling and doesn't contain any fragrance .Find out yourself, why many likes this product a lot! Serves all skin types. If you have drier skin, it is best to follow it with heavier moisturizing cream. It is important to note that Mizon has its own order of use for this product that deviate from the traditonal Korean Skincare Routine which is the use of product from the lightest consistency to the heaviest consistency. 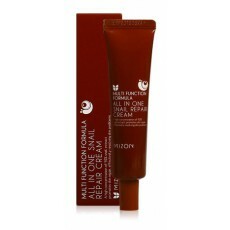 As per Mizon recommendation of use: After cleansing face, apply All in One Repair Cream to face and neck. Massage it gently to skin until well absorbed. Follow it up with a heavier moisturizer if you have drier skin. You can use it in the morning and or in the evening. If you think you have sensitivity to snail, patch test this product first before applying entirely to face.